Merkaba is another name for one's Light Body. Part of full consciousness, when spiritual, astral and physical bodies are integrated. The Merkaba allows self to shrink to baseball size and to travel anywhere, instantly. The MerKaBa is a spinning structure of light similar to the chakras. It is similar in that when spinning properly it works as an inter-dimensional gateway – kind of a Star Gate - so that higher consciousness may incarnate into the physical body. The difference is that the MerKaBa is much larger, encompassing the entire body. 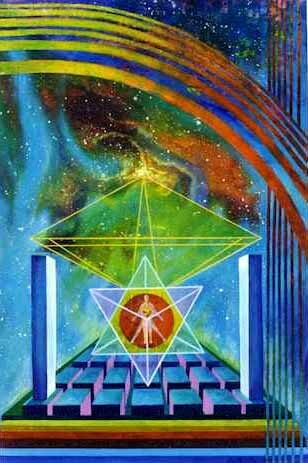 In fact the MerKaBa is the structure of spinning light which allows for the incarnation of the Light body itself. Without the MerKaBa being activated the other parts of the Light body such as the Chakra’s cannot incarnate properly and may not be stable. 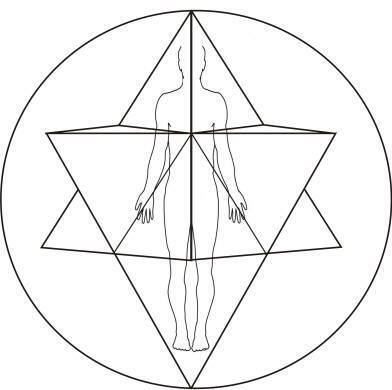 The above diagram shows the foundation of the MerKaBa in its non-spinning state. We all have fields of light around us like in this picture. While in a non-spinning state they do not perform their function properly just like a Chakra that does not spin. The gateway to higher consciousness is closed and so the rest of the Light body has trouble grounding and incarnating within the aura. When the MerKaBa is activated it forms a counter-rotating field of spiritual light which creates a dimensional gateway for the Light body to stabilize within the physical body and for its other structures such as the Chakra’s to activate and stabilize as well. This allows for the possibility of incarnating higher consciousness permanently as well as raising the vibration of the physical body. You will be also aligned to your Higher Self and Monad. If you successfully activate the Merkaba, it becomes possible to take the physical body into the fourth dimension. In Hebrew MerKaBa is spelt MerKaVa which means Chariot and indeed that’s exactly what it is. It is a vehicle which can take you and your body between dimensions. Once raised into the fourth dimension the physical body will become much more subtle and may live for much longer. The possibility is also there to rise into even higher dimensions. This is where multidimensional spiritual Healing takes place. When the MerKaBa spins at a certain speed, a disk of light shoots out from the base Chakra, in the perfect centre of the spinning star tetrahedron, to around 50-60 feet in diameter (illustrated above). This is what your activated MerKaBa would look like and in fact this field of light has an electro-magnetic component that can be seen with the appropriate instruments on a computer monitor. The Chakra's, The Column and the MerKaBa are only a small part of the Light body but they are the main structures that we will be working with. For spiritual transformation to occur it is practice that is needed. You can study anatomy and biology all you like but until you do physical exercise your body will not become fit. Similarly, studying the structures of the Light body will not awaken them. Practice will. MERKABA BREATH: At this same moment, with empty lungs, begin to breath in a complete yogic manner. Breath through your nostrils only, except at certain places which will be described. Simply put, breath from your stomach first, then your diaphragm, and finally your chest. Do this in one movement, not three parts. The exhale is completed either by holding the chest firm and relaxing the stomach, slowly releasing the air, or by holding the stomach firm and relaxing the chest. The most important aspect is that this breathing must be rhythmic. Begin by using seven seconds in and seven seconds out, but as you get familiar with this meditation, find your own rhythm. The following instructions for a complete Yogic Breath are from "the Hindu-Yogi Science of Breath" by Yogi Ramacharake. Perhaps this description will be helpful. BODY: Move your eyes slightly toward each other, or, in other words, slightly cross your eyes. Now bring them up to the top of their sockets, or in other words, look up. Also, this looking up motion should not be extreme. You will feel a tingling feeling between your eyes in the area of your third eye . You can now look down to the lowest point you can, as fast as you can. You should feel an electrical sensation move down your spine. The MIND and BODY must coordinate the above mental exercis e with the eye movements. The eyes look down from their up position at the same time the mind sees the triangular horizontal plane of the female tetrahedron move down to the apex of the female tetrahedron. This combined exercise will clean out the negative thoughts and feelings that have entered into your electrical system. Specifically, it will clean out the part of your electrical system that is associated with the particular mudra you are using. Immediately upon pulsing the energy down your spine, you change mudras to the next one and begin the entire cycle over again. MERKABA BREATH: Deep rhythmic Yogic Merkaba breathing, seven seconds in and seven seconds out. There is no holding of the breath from now on. The flow of prana from the two poles will not stop or change in any way when you go from inhale to exhale. It will be a continuous flow that will not stop for a long as you breath in this manner, even after death. MERKABA BREATH: Do not force the air out of your lungs. When your lungs are empty naturally, immediately begin the next breath. MERKABA BREATH: Sphere grows brighter and brighter as you inhale. MERKABA BREATH: As you exhale, the sphere continues to grow brighter and brighter. MIND: At the moment of exhale, the small sphere two hand lengths in diameter bulges to expand. In one second, combined with the breath talked about below, the sphere expands quickly out to the sphere of Leonardo, out at your finger tips of your extended arms. Your body is now completely enclosed within a huge sphere of brilliant white light. You have returned to the ancient form of spherical Merkaba breathing. However, at this point, this sphere is not stable. You MUST breath three more times to keep the sphere stable. MERKABA BREATH: At the moment of exhale, make a small hole with your lips and blow out your air with pressure. As you feel the sphere begin to bulge, all within the first second of this exhale, let all of your air out rapidly. The sphere will expand at that moment. MERKABA BREATH: Breath rhythmically and deeply. At the end of the thirteenth breath you have stabilized the large sphere and are ready for the important 14th breath. MERKABA BREATH: Rhythmic breath and deep. However, if you continue to breathe from your Christ center without moving on to the MER-KA-BA, which is what is recommended until you have made contact with your Higher Self, then shift to a shallow breath. In other words, breath rhythmically but in a comfortable manner where your attention is more on the flow of energy moving up and down the tube meeting at the sternum and expanding out to the large sphere. Just feel the flow. Use your feminine side to just be. At this point don't think, just breath, feel and be. Feel your connection to All Life through the Christ Breath. Remember your intimate connection with God. MERKABA BREATH: Breath Yogic and rhythmically an deeply again, but only for the next three breaths, after that return to the shallow Merkaba breathing. MERKABA BREATH: Make a small hole with your lips just like you did for breath Number Ten. Blow out in the same manner, and as you do, feel the two sets of tetrahedrons take off spinning. MERKABA BREATH: Same as breath 16, make a small hole in your lips, and blow out with pressure. It is at this point that the speeds increases. As you feel the speed increasing, let out all your breath with force. This action will cause the higher speed to be fully obtained and the MER-KA-BA to be formed. MERKABA BREATH: Breathe rhythmically and in a Yogic manner. MERKABA BREATH: Same as breath 15 and 16, make a small hole in your lips, and blow out with pressure. As you feel the speed take off, let all your breath out with force. You are now in your stable and Third dimensionally tuned MER-KA-BA. With the help of your Higher Self, you will understand what this really means.